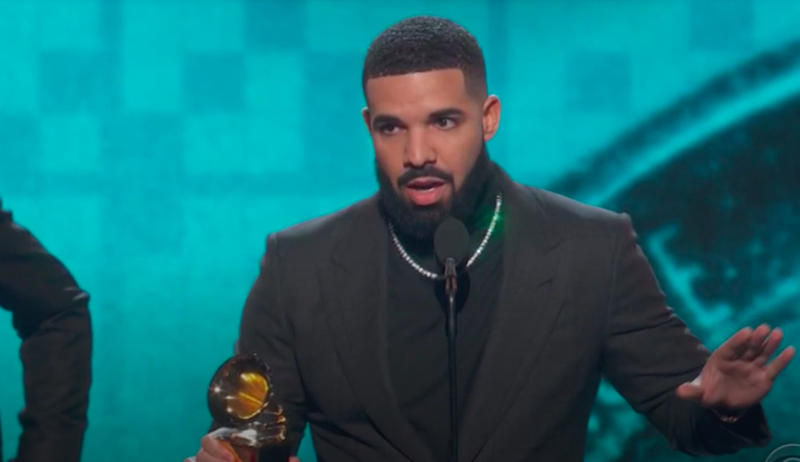 After Drake won the award for Best Rap Song, for “God’s Plan,” the rapper made a surprise appearance to accept it. His presence was somewhat of a shock, considering he’d declined an invitation to perform and historically hasn’t been a Grammys. So when he began speaking, it was clear that he was taking his win with a grain of salt—and, probably, a twinge of saltiness. It’s clear why, too: the Grammys have been historically out-of-touch with rap, if not outright disrespectful, declining to air most of the awards in the category and only nominally allowing rap performances, despite rap being the most profitable and popular genre. When the Grammys have showcased rappers, their performances are often wedged in awkwardly with rock bands, as though producers are uncomfortable with rap on its own terms. For Sunday night’s awards, Cardi B was allowed to do her thing with a cadre of dancers and a pianist, unscathed and wildly entertaining, but Post-Malone performed with the Red Hot Chili Peppers, reminding us of what producers on this show seem to value most, perhaps gleefully ushering in a new age of rap-rock. So when Drake began talking in his speech about how the music industry is an “opinion-based sport,” it was clear he was speaking both to the Grammys itself but also to the musicians in his category who he beat out. His point was about touching hearts and minds, and he seemed to be inching towards the assertion that “winning” wasn’t necessarily based on awards, or even on capital. His larger point was that the Grammys themselves don’t matter in the long run, hearts and minds do—emphasizing the message delivered again and again throughout the ceremony itself, by host Alicia Keys and other musicians tasked with reading from the teleprompter. But before Drake could continue, he was cut off, constrained by time or the Grammys’ own estimation of itself. It was telling.